Discussion in 'Astronomy, Exobiology, & Cosmology' started by paddoboy, Nov 6, 2017. Light curve of OGLE-2016-BLG-1190. 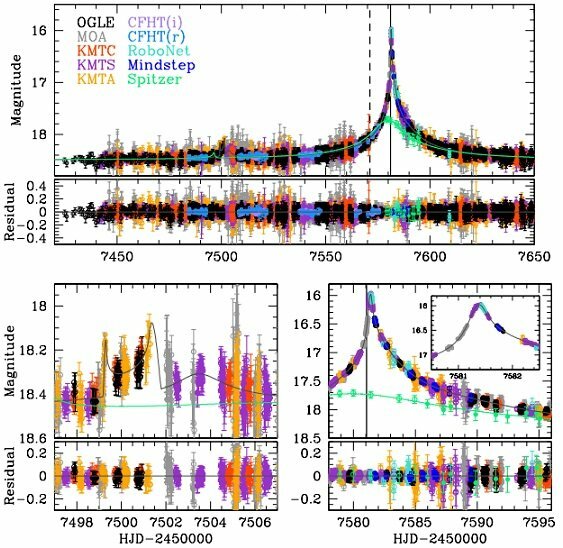 The data points are colored as indicated by observatory in the top panel, which shows the full light curve. Credit: Ryu et al., 2017. (Phys.org)—As a result of NASA's Spitzer Space Telescope observations of a microlensing event, astronomers have found an extremely massive alien world circling a star located in the Milky Way's bulge. The newly discovered planet, designated OGLE-2016-BLG-1190Lb, is the first Spitzer microlensing exoworld residing in the galactic bulge. The finding was presented October 27 in a paper published on arXiv.org. Microlensing is very useful technique for detecting alien worlds in the inner galactic disk and bulge, where it is difficult to search for planets with other methods. It facilitates the discovery of distant objects by using background stars as flashlights. If a star moves in front of an another star, the light from the distant star is bent by the gravitational pull of the nearer star and the more distant star is magnified. Microlensing does not rely on the light from the host stars; thus, it can detect planets, even when the host stars cannot be detected. We report the discovery of OGLE-2016-BLG-1190Lb, which is likely to be the first Spitzer microlensing planet in the Galactic bulge/bar, an assignation that can be confirmed by two epochs of high-resolution imaging of the combined source-lens baseline object. The planet’s mass Mp = 13.4±0.9 MJ places it right at the deuterium burning limit, i.e., the conventional boundary between “planets” and “brown dwarfs”. Its existence raises the question of whether such objects are really “planets” (formed within the disks of their hosts) or “failed stars” (low mass objects formed by gas fragmentation). This question may ultimately be addressed by comparing disk and bulge/bar planets, which is a goal of the Spitzer microlens program. The host is a G dwarf Mhost = 0.89 ± 0.07 M⊙ and the planet has a semi-major axis a ∼ 2.0 AU. We use Kepler K2 Campaign 9 microlensing data to break the lens-mass degeneracy that generically impacts parallax solutions from Earth-Spitzer observations alone, which is the first successful application of this approach. The microlensing data, derived primarily from near-continuous, ultradense survey observations from OGLE, MOA, and three KMTNet telescopes, contain more orbital information than for any previous microlensing planet, but not quite enough to accurately specify the full orbit. However, these data do permit the first rigorous test of microlensing orbital-motion measurements, which are typically derived from data taken over < 1% of an orbital period.